Raised in Union Lake, Michigan in a lake house meant one thing: visitors! Family, friends, boaters, fishermen, swimmers, sailors and neighborhood friends…my mother fed them all. Every sense awakens during summers in the county. I can still smell the charcoal off the grill, I can hear the boats humming by, I can taste the Leelanau peaches. I began my career early, as many other teenagers did, working “in the corn” both detasseling and roguing. The years spent growing organic produce gave me an appreciation and an education that changed my perspective of food and our local food systems forever. The truth about working with food; whether it be growing, cooking, serving or marketing, is that done well it has the ability to comfort and excite all at the same time. I spent my youth just down the road on a centennial family farm in Lake Leelanau. My grandfather showed me how to hunt, fish, and work hard alongside nature. I was working in downtown Chicago with one of my most treasured restaurant families when I got the call: I had to get back to the woods. Life in Northern MI is where my heart resides. We moved a lot when I was growing up but the majority of my youth was spent in Texas and Southern California. I got my first job working at a deli when I was 14 and I’ve been in the industry ever since. Hailing from 1972 in Traverse City’s cold season I was born to ski, skate, and build the finer things. Epicure started as a kernel of an idea early into our friendship. Andy and I met while cooking at a Leelanau County restaurant. Every night after work the kitchen staff would have a few beers and go skinny-dipping, washing away the kitchen grime while stargazing from the velvety black water. Sitting on the dock those warm summer nights, we would ramble on about ideas, dreams, future travels, how we wanted life to be. Becoming fast friends, we kept in touch through many significant others, cross country relocations, world travels and forays into other professions, maintaining our connection to professional kitchens all the while. Some 8 years later after many travels, blissful days spent simply absorbing life and long nights in hot kitchens; we felt the pull to put down roots here in Northern Michigan. When we started the company, our main goal was to showcase the best food and talent that the region has to offer. After years of witnessing firsthand the immense ripple effect of the local food movement elsewhere, we were inspired to do what we could to facilitate those same positive effects here in Northern Michigan. 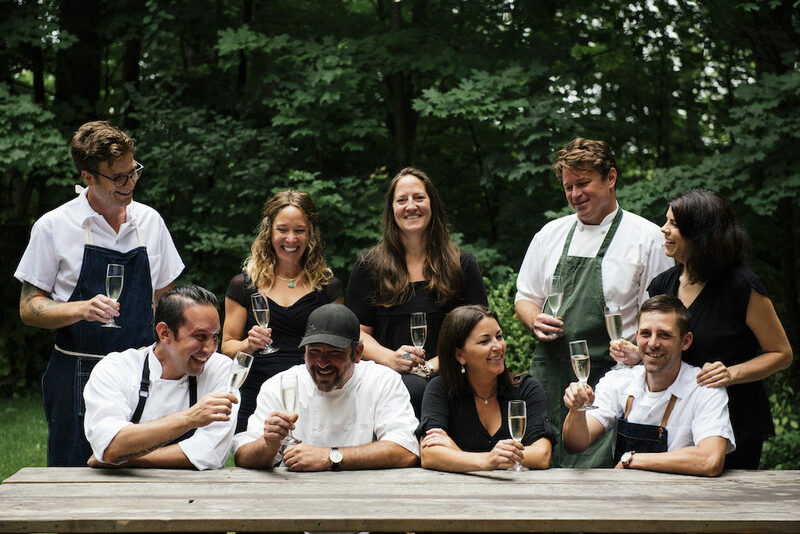 We worked tirelessly to showcase artisanally produced food and build a team of incredibly talented and skilled friends. Andy’s art background has played a huge role in the presentation of our food, and is now something for which we are known. Our team is our family, and because of that, atmosphere at our events reflects the bond. We are fortunate enough to work as ‘travel chefs” in our off-season. Along the way, we pick up new food sources, new preparations and ways to create the perfect experience for our clients. We collaborate with other businesses on all sorts of projects; it keeps our process fresh. We enjoy the work and feel fortunate to share our kitchen with such a talented team of true hospitalitarians. Our satisfaction lies in knowing that we are providing you, our guest with an experience true to our convictions, and those of our team.